Pacific Global One, the aviation arm of PLDT, said it opened a charter flight service to take advantage of the rising demand for travel on private aircraft both for leisure and business. “With the rise in demand for tourism and business travel, Pacific Global One is positioned to capture this niche for charter flights,” Butch Meily, Pacific Global One president and chief operating officer said. “With our new service, Pacific Global One can now provide private flights to Balesin in Quezon, Amanpulo in Pamalican Island, Baguio in the north and Boracay in Panay, among other routes,” he added. Pacific Global One will initially offer two aircraft including the Beechcraft Super King Air 350—a turboprop twin which can accommodate eight passengers with two pilots. Running at a flight speed of 250 knots, the King Air 350 can fly for five hours. The other aircraft is the Bell 429 helicopter which has a five-seat capacity. With a full tank, the helicopter can fly for three hours. All aircraft are capable of flight in all-weather conditions and are air-conditioned. Manned by seasoned pilots who are former Philippine Air Force and Navy veterans as well as a Canadian flyer, Pacific Global One flies all over the Philippines. “The rates we offer for our charter flights are very competitive. We also open our doors to small groups who need an affordable, reliable, and accessible transportation to go to various destinations nationwide—whether for work or leisure,” Meily added. He stressed the role of the company, which received a license to fly charter flights a few months ago, in making travel more accessible and affordable. “By giving the public the chance to fly corporate aircraft, Pacific Global One hopes to contribute to the growth of the travel industry in the Philippines,” he said. 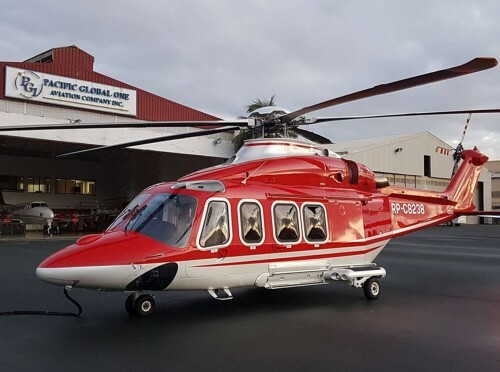 Pacific Global One also has a VIP configured chopper—a high-end AW139 helicopter and a Global XRS, a long-range business jet that are for the private use of the companies led by business leader Manuel Pangilinan.